Built to break records, wear these Nike Zoom Fly Flyknit Ladies Running Shoes in Black and White. These trainers from Nike feature a flyknit upper that is lightweight, breathable and hold the foot for the perfect fit. Nike rect technology in the midsole ensures cushioning that bounces back and provides extra oomph for each step. 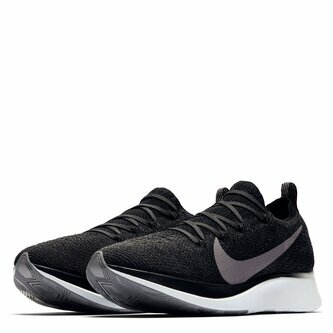 The Zoom Fly Flyknit's yuse the sa`me full-length carbon fibre plate used in the Vaporfly to give s snappy feel that works in conjunction with the React to provide ultimate responsiveness.